Different types of heart disease are characterized by which part of the heart is abnormal or affected and in what way. In the case of cardiomyopathy, the abnormality involves the heart muscles itself. In dilated cardiomyopathy (DCM), specifically, the muscle wall of the heart becomes thin which results in a bigger but weaker heart that is not efficient at pumping blood. Click here to learn more about dilated cardiomyopathy basics. Are Dobermans at a greater risk for dilated cardiomyopathy? 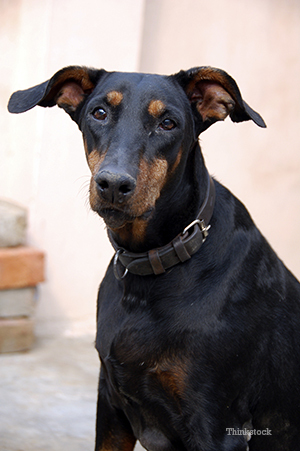 In dogs, DCM occurs at a higher incidence in specific breeds including the Doberman pinscher. While there are likely multiple factors that combine to produce clinical DCM, the fact that the disorder occurs at a higher incidence in specific breeds has always suggested that there is a heritable genetic component to this disease, says Cornell University College of Veterinary Medicine. Dr. Kathryn Meurs, of NC State, has identified one gene mutation that is responsible for the disease. However, since there could be other mutations involved as well, research is ongoing. For now, though, you can have your Doberman tested for the presence of this one mutation. You just need to keep in mind that a negative test does not completely rule out the possibility of your dog developing DCM (since I already mentioned that there are likely other factors and/or mutations involved). Also, a positive test does not always mean your dog will develop the disease. Regardless of any genetic test results, to protect your dog, awareness and vigilance are the key. Some dogs develop cardiac arrhythmias (abnormal beats and irregular rhythms) that can cause sudden death1. Your veterinarian can listen to your dog’s heart and lungs to detect some abnormalities, but more sophisticated testing is far more accurate in identifying problems, especially early on in the disease. EKG tracings can be performed over an entire 24 hour period using a special Holter monitor system making it much more likely to record abnormal beats when they occur (compared to only a few minutes of recording in the clinic setting). In addition, echocardiography/ultrasound is extremely valuable in allowing visualization of not only heart size but wall thickness and dynamic function of the muscle with every beat. All of these tests combined will allow your veterinarian to not only make the diagnosis of DCM, if it exists, but also to aid in determining which medications will be best suited to your individual dog’s condition. How is dilated cardiomyopathy in Dobermans treated? Unfortunately, there is not cure for DCM, and the prognosis for Dobermans with DCM is less favorable than in other breeds. Medical management can, however, provide significant improvement in lifespan and quality of life in affected dogs1. Therapy is geared toward helping the dog’s heart function better (pump more effectively with fewer abnormal beats) and toward minimizing the fluid accumulation in the lungs and other organs that occurs because of compromised blood flow. Your veterinarian may put your dog on blood pressure medications that reduce resistance to the forward flow of blood and diuretics to clear fluid, if edema exists. Drugs can improve the strength of the heart muscle contractions so that more blood is pushed forward with each beat. Other drugs can decrease the incidence of arrhythmias and abnormal beats and help normalize the heart rate. If you have a Doberman, it is important to be aware of the increased risk of DCM in the breed, to work with your veterinarian and to closely monitor your dog in order to make an early diagnosis, if DCM does occur. If necessary you and your veterinarian can tailor appropriate medical therapy to your dog’s individual needs. 1. College of Veterinary Medicine - Cornell University." Canine Dilated Cardiomyopathy (DCM). Cornell University Hospital for Animals, n.d. Web. 26 Sept. 2014.